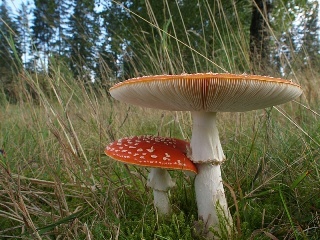 Amanita muscaria is common throughout most of the northern hemisphere. Although it has been known to inhabit fields (above right), it mainly lives in wooded areas (above left), particularly around pine, spruce, fir, birch, and aspen. 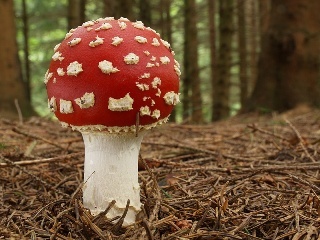 Which trees it associates with depends on its geographic location.. A. muscaria forms a very important symbiotic relationship with these trees, aiding in nutrition, that I will discuss later. The abundance and organization of A. muscaria is also quite variable. It can be found alone, in large, dense colonies, or large rings. We will continue our "trip" though the world of A. muscaria by looking into how it acquires Nutrition.